I am very excited to share a new resource for those of you readers who teach, parent, babysit, or ever encounter young people who could/should/would learn Hebrew. 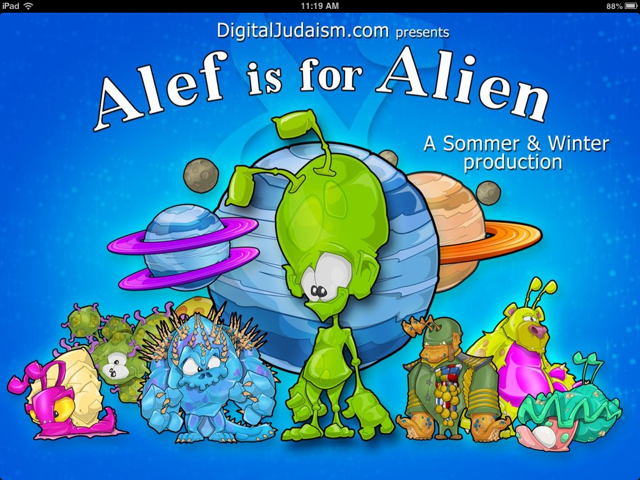 My colleague Rabbi Michael Sommer (aka Abba Sababa) has written an awesome book and Eric Winter has done amazing illustrations for an e-book now available on the iTunes store called Alef is for Alien. You can download this book (for the iBook app only at present) here. The book is awesome. On every page you can hear the pronunciation of a Hebrew letter and there are VERY unique words that begin with each letter that also can be heard. (Hey is for Holographic Alien Signal, for example). At the end there is a beautiful image of all of the letters that could be used for recognition and review. The illustrations in this book are amazing. I’m not a huge reader of children’s literature (though when I read aloud to a child I always include voices), but these are top-notch. If my stellar review wasn’t enough of a reason for you to spend $4.99 to purchase this book, maybe the reason behind this collaboration will be, Superman Sam. I am glad that I have this book on my iPad for the next time a young person is around and they want to read an age-appropriate book or I need to assist a young person (or ADULT) in a review of the letters of the Hebrew alef-bet and vowel sounds! Download this book. You will be glad that you did! This entry was posted in technology, Torah and tagged books, education. Bookmark the permalink.